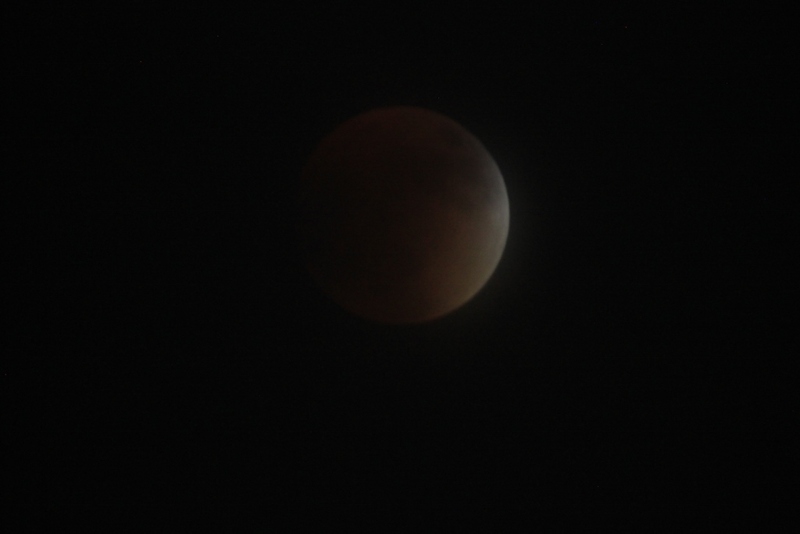 A few photos from the Supermoon Lunar Eclipse last night. It was a bit cloudy so not the clearest view. By the time we saw the moon it was already cloaked in darkness. We're on a "junket" to Round Top, Texas and Texas Antiques Week. 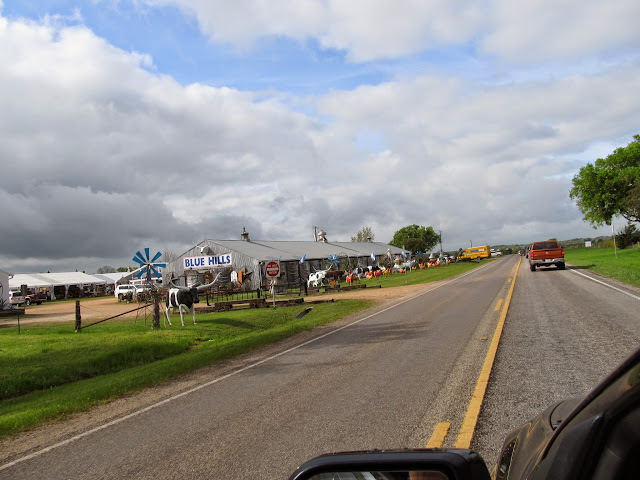 In my last post we drove down through Round Top past miles and miles of stuff until we spotted the "can't miss it" pink suburban known as "Large Marge" and turned in through the winged gates for Junk Gypsy World HQ, the home of the Junk Gypsies of TV fame. Welcome to Round Top, Texas (Pop. 90), where in a bit of departure from garden visits and plants, I'm taking you on a "junket" to Texas Antiques Week when we were there in March. It used to be just one weekend and over several decades it has grown to more than two weeks. The twice-yearly market is on again from now through October 4th so it's a good time to show you what you might see if you decide to go. No surprise to regular readers, I love to add stuff to my garden so back in March when we spent a few days visiting my family in nearby Chappell Hill we took a side trip to Round Top. I've already shared several posts on the gardens at Festival Hill in Round Top and now we'll take a look at some of the chaos that goes on along a usually sleepy road known as TX 237. Turn off U.S. 290 onto TX 237 and the show begins. At first we just cruise along deciding where to stop...the choices are endless. Continuing with our preview of gardens for the Watersaver Landscape Tour to be held on October 24th. When friend and fellow blogger Heather Ginsburg of Xericstyle, who also works as a conservation consultant for San Antonio Water System (SAWS), contacted me about previewing gardens for the tour I jumped at the chance to visit these very special gardens. 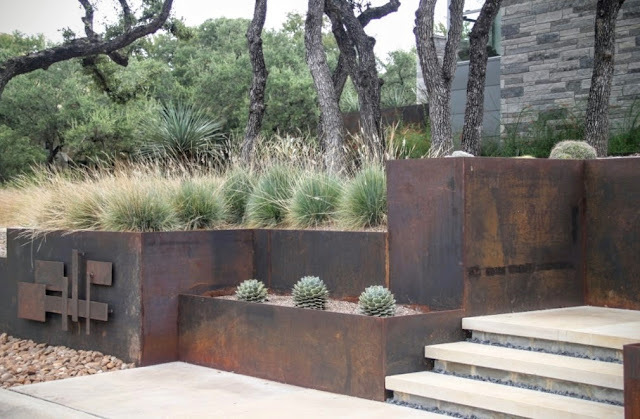 Pam Penick of Digging joined me from Austin for a day of garden tours, so after seeing Pat Mozersky's lush foliage garden we drove just a few blocks to tour an entirely different landscape style: a modern xeric garden. A garden designed by Austin's Mark Word in San Antonio? Of course, I jumped at the opportunity to preview the garden ahead of the Watersaver Landscape Tour to be held October 24th. 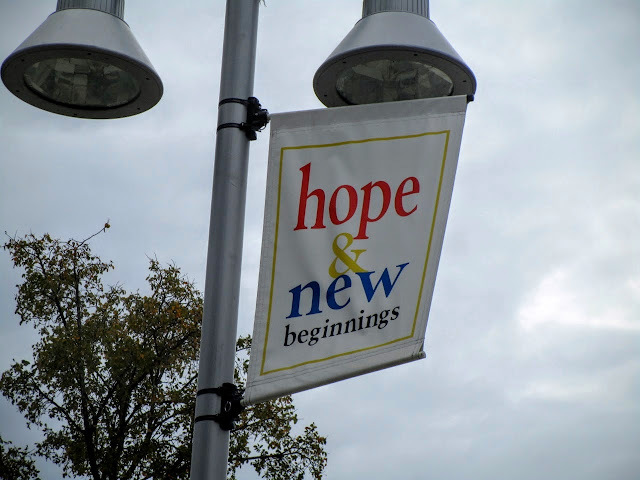 I invited friend and fellow blogger Pam Penick to join me on a day of garden visits. 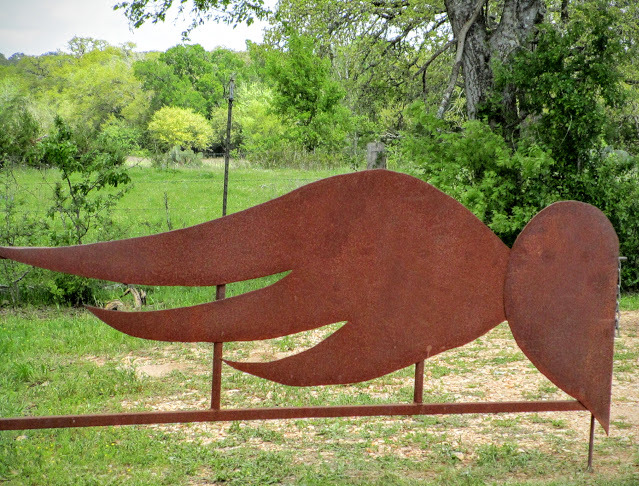 Pam has profiled Mark Word's landscapes in the Austin area on her blog Digging. Entering along the sedge-fringed stone walkway builds anticipation for what's behind the gate. 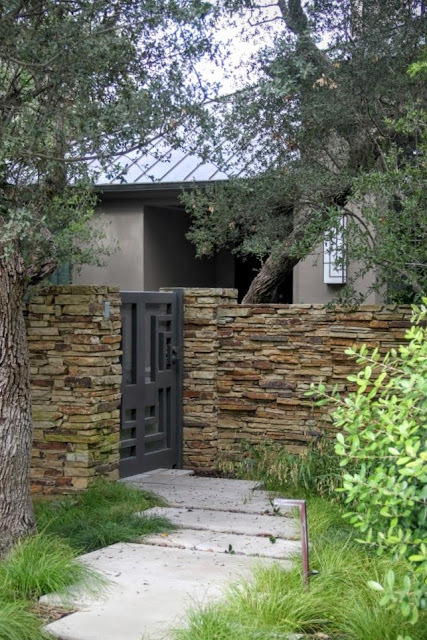 Just in view above the stacked-stone wall a single sconce to the right of the front door echoes the gate and walkway details. It was a delight to meet the owner of this home and garden, Pat Mozersky, who recently retired from writing a food column, Chef's Secrets, for our local paper. Whenever I had the Taste section in my hands, Pat's column was the first place I turned for the scoop on favorite restaurant dishes. Owls normally stay up all night and sleep through the day. Apparently one Barred Owl hasn't developed the night owl habit and visits the birdbath during the day. In my last Wildlife Wednesday post I promised a more detailed view. We enjoyed watching our frequent visitor through the kitchen windows almost daily for several weeks in August. A cute dance from one water saucer to the other. It's the first Wednesday of September and I'm joining Tina at My Gardener Says... for a look at the wildlife in my yard. 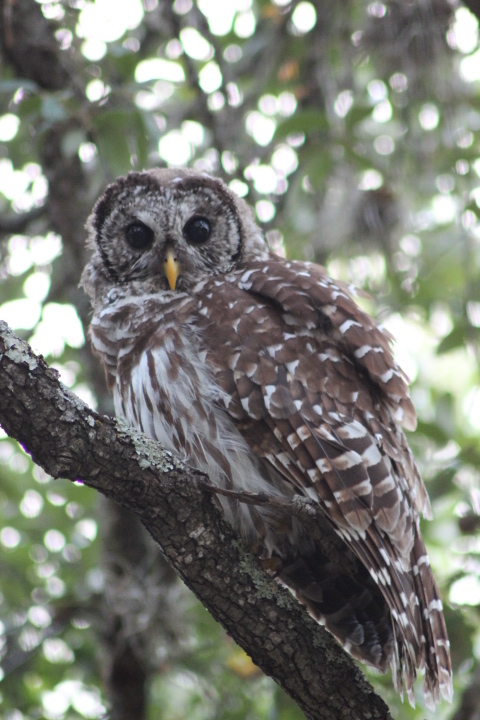 Last month for Wildlife Wednesday I featured our frequent guest the Barred Owl which was surprisingly active in the daytime. We've seen him a few more times.